Monica J. Brown. Grace. Acrylic & mixed media on wood. 12 by 12 in. 2017. The Path of Memory: Mixed Media Works by Monica J. Brown is on display February 2 through March 31 at Harold Washington Library Center on the ground floor in the Popular Library exhibit cases and the Congress Corridor east display window. Chicago artist Monica J. Brown explores the lives of her maternal ancestors through her mixed media artwork. She states, "Old photographs of my grandmothers are the images which guided me in an archaeological mining for the gems of their lives. These photos led me deeper into their stories, made me wish to imagine their lives—their interior lives—and made me want to tell their truth." 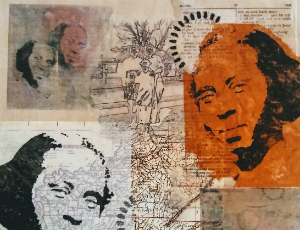 Brown will give a Family History Collage workshop from 1 p.m. to 3 p.m. Saturday, February 3 at Harold Washington Library Center.